"Most of my cooking and baking is from scratch, and I think it's worth the time and effort. 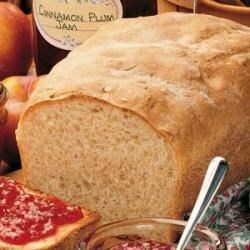 Everyone enjoys homemade goodies like this delicious bread." In a large mixing bowl, combine 2 cups flour, yeast, sugar, salt and baking soda. Add warm milk and water; beat on low speed for 30 seconds, scraping bowl occasionally. Beat on high for 3 minutes. Stir in remaining flour (batter will be stiff). Do not knead. Grease two 8-1/2-in. x 4-1/2-in. x 2-1/2-in. loaf pans. Sprinkle pans with cornmeal. Spoon batter into the pans and sprinkle cornmeal on top. Cover and let rise in a warm place until doubled, about 45 minutes. Bake at 375 degrees F for 35 minutes or until golden brown. Remove from pans immediately to cool on wire racks. Very good. I used 1 tsp baking soda (makes more nooks and crannies). I also used 1/2 Tbsp of vinegar in the milk and 2 Tbsp. canola oil. Makes it tast more like and English muffin. This is so easy for a nice homemade breakfast treat. I have substituted 1 cup of flour with whole wheat flour instead to make it a little more nutritious, yet still good.